Introducing the UK Business Tech Awards! 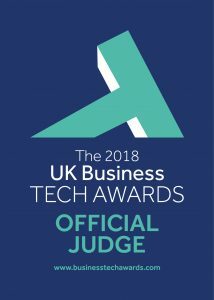 I am delighted to announce that I will be judging the inaugural UK Business Tech Awards, an event taking place at the Montcalm Marble Arch in London on 20 November 2018. The UK Business Tech Awards celebrates the UK’s finest tech businesses and rewards innovative and exceptional application of technology to transform and grow businesses. We will be awarding 19 categories including sector specific campaigns and best agency awards. You have until 14 September 2018 to submit your entries, with an extended late entry period open until the 21 September 2018. Entries are charged an administration fee of £100 + VAT per entry until 14 September, with an late submission fee of £150 + VAT after 14 September and up until 21 September when entries submissions close. The judging session will commence just under one month later on 10 October 2018. The 2018 awards ceremony will take place on Tuesday 20 November at the Montcalm Marble Arch in London. The awards will attract an audience of around 300 senior business professionals in the technology sector from across the UK and will be an exceptional networking opportunity. The UK Business Tech Awards are brought to you by Business Cloud and Don’t Panic.